As a mobile application developer that works with Cordova, i know how difficult it is to debug the native parts of the application, for example when you create a native plugin for your application (Android Studio isn't useful in this case). Messing around with the Android Debug Bridge (ADB) trying to find out why my application was failing, i noticed how ***** it was to find the exceptions inside a log file where you don't see nothing highlighted in your text editor. That's why after some research, Android Log Viewer seems to be a tool that deserves to be highlighted among many others. 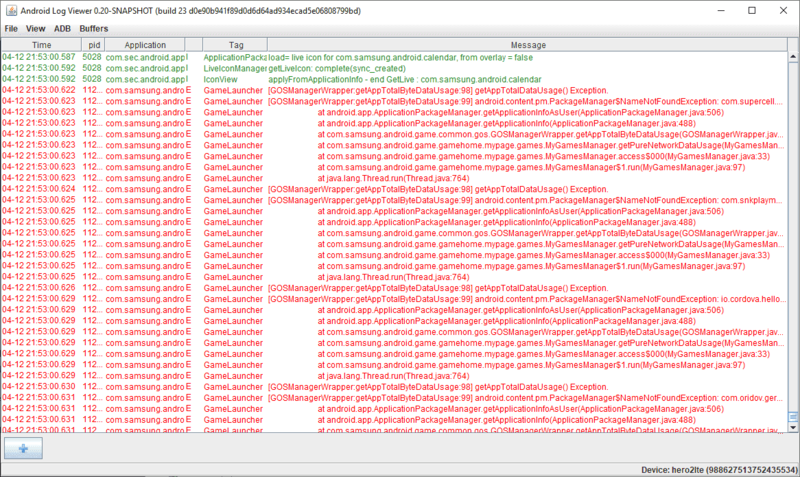 Android log viewer is the tool to simplify analysis of the Android logs. You can check the source code of the application at the official repository at Bitbucket here or visit directly the downloads zone to download the latest version of the application. You may enter several tags, application names or PIDs separated with commas, any of them will be filtered. Message, tag and application name filters support regular expressions. If several criteria are specified, only records that match all of them will be filtered. In this dialog, you need to specify the path to the ADB executable, in our case it was C:\USERS\SDKCA\APPDATA\LOCAL\ANDROID\SDK\PLATFORM-TOOLS\ADB.EXE. Now, you only need to connect your device to the PC and the application will automatically starts processing the logs through ADB in Realtime. That's basically all about this useful application. So now if someone asks for a tool to debug in realtime a cordova application with ADB, you know the answer already.